TYPE: 2-Door Coupe, 2-Door Cabriolet, 2-Door Convertible. RELIABILITY: Best with history and bought from a specialist. Watch out for worn suspension, driveshaft and shocks, all very expensive to replace. Rust now appearing in earlier models can be terminal. MORE: SEP 1990 'Cat' fitted to V12 models. 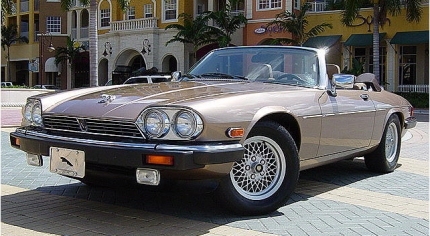 Limited edition 'Le Mans' XJ-S V12 (not listed) launched in UK. MAY 1991 4.0 Coupe launched with 3980cc engine and 'Cat'. Uprated 280 bhp 5.3 V12 models have new fuel control system and low-loss catalyst. All models have styling revisions including new grille, new headlamps and new rear wings. And restyled interior with new sports seats. New fascia and walnut veneer trim. OCT 1991 Revised XJR-S Coupe launched in the UK. MAY 1992 4.0 Convertible launched with 3980 cc 'Cat'-equipped engine and automatic transmission. SEP 1992 All models have driver's side airbag safety system. Optional 'Touring' suspension available on 4.0 Coupe. 5-speed gearbox now available on 4.0 Convertible. OCT 1992 Special 'Insignia' coachwork and trim available at extra cost, priced according to specification. MAY 1993 Revised range: new bumpers, restyled alloy wheels, new alarm and detailed improvements. Coupe models have standard 'Sports' suspension ('Touring' suspension optional), Convertibles have standard 'Touring' suspension ('Sports' suspension optional) and 2+2 seating. V12 models now have 6.0 engine (5994cc) and new GM 4 speed automatic transmission. SEP 1993 Revisions include improved heat/vent system, passenger airbag. High-security immobiliser system option available. JUN 1994 Revisions: 241 bhp engine on 4.0 models; low-inertia torque converter on 4.0 automatic; 4.0 models have 5-spoke alloy wheels, colour keyed grille and exterior trim; V12 6.0 models have 20-spoke alloy wheels, black grille and chrome exterior trim; all models have new trim (cloth/leather on 4.0, full leather on V12 6.0) and uprated audio; Coupe models have improved rear seating.